The words you need for business. Today, thanks to the Internet and social media, most companies and independent professionals are online writers and publishers. 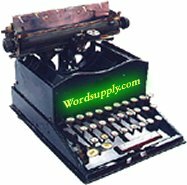 Wordsupply Inc. exists to help people develop and promote the words they need for business. Offering business writing and social media consulting, Wordsupply is on a mission to arm professionals with text that best represents their integrity, intelligence, and intentions. Founded by Dave McClintock in March 2000, Wordsupply serves a broad range of professionals, from management consultants to book authors, executives, and entrepreneurs. When you entrust your writing projects and social media presence to Wordsupply, you call on a book editor’s high quality standards, an MBA’s strategic sense, and a small company manager’s ferocious drive for efficiency and savings. To request a proposal, please e-mail Dave McClintock at dave@wordsupply.com or call/text (718) 864-5080. Your company’s opportunities for writing and social media marketing are numerous and complex. Wordsupply can manage and execute your plans—and broadcast your message to the right audience, at the right time, in the right place. Copyright © 2000-2019 by Wordsupply Incorporated. "Wordsupply" is a registered trademark of Wordsupply Incorporated.